Get Active with Meerkats - meerkat gifts, meerkat encounter & meerkat fun. Simples! Meerkats have stolen the hearts of many animal lovers, so if you have a meerkat lover in your family, why not treat them to a Meerkat Encounter? We gave my Dad this for his 80th birthday present at Paradise Wildlife Park in Hertfordshire. The keeper who took him to the Meerkat enclosure was friendly, knowledgeable and passionate about the meerkats in his care. 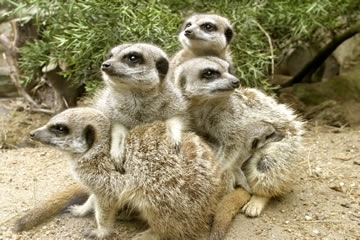 Dad sat on a log, & quickly became a human climbing frame as the meerkats crawled all over him. One even stuck his nose in Dad's jacket! As Dad fed the meerkats their breakfast, the keeper told him all about their characteristics & habits. It was the best birthday present we've even given Dad - I've never seen such a smile on his face! I highly recommend this gift. Start off with complimentary refreshments in the Discovery Centre at Paradise Wildlife Park. 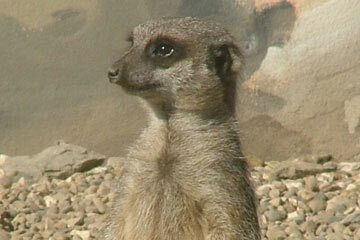 Then meet one of the team and head to the meerkat enclosure for a full safety briefing. This is a great opportunity to get an insight into meerkats and their characteristics and to ask lots of questions of their keepers. A park team member remains on hand throughout, and the meerkats will probably treat you as a human climbing frame! Take home a souvenir t-shirt and presentation certificate as a memento. You can arrive early and stay late to enjoy the other facilities within the park. Meet the team who care for these creatures and help to prepare their food before you enter the enclosure and scatter their food. Spend the rest of the day exploring the safari park. Included is entry to the safari park to spend the rest of the day10% off an annual safari park membership. Go to Red Letter Days to buy this experience. Adopt a meerkat and help Meerkat Magic - a conservation project that protects wild meerkats! You'll receive a souvenir poster, a personalised supporter certificate and meerkat photograph, and lots of information about these fascinating creatures.